Hi there! Today’s post is about Dolly’s Mixtures’ Rainbow Sherbet Shower Gel. Well, I’ve already reviewed a number of products from this brand. And whilst I didn’t like every single product, I still wanted to give this one a chance. So let me tell you more! OK, so I used this shower gel this morning – and I hated it right away. As soon as I had lathered up the shower gel, it started to smell like a mix of plastic and something fizzy. It was bad. Really bad! I don’t know who thought that bottling and selling this stuff would be a good idea. I mean, someone must have OK’ed this stuff – but why? I’ll squeeze the contents of this bottle into the hand soap dispenser in the kitchen. And that’ll be the end of it. Dolly’s Mixtures’ Rainbow Sherbet Shower Gel is available as 300ml for £2 (I spent £1 when it was on special). I’ve also seen Dolly’s Mixtures products on sale at Poundland – and I think that’s not a good sign. I think the entire line might be discontinued! Hi there! Today I’m reviewing two sweet smelling body products – Dolly’s Mixtures Sweetness & Light Candy Floss Shower Gel and Dolly’s Mixtures Sweetness & Light Candy Floss Body Mist. Dolly’s Mixtures products are exclusive to Asda. The 300ml shower gels and the 100ml body mists are £2 each. Now onto the review! Dolly’s Mixtures Sweetness & Light Candy Floss Shower Gel is quite nice. The candy floss fragrance is spot on, and the shower gel is gentle to the skin. 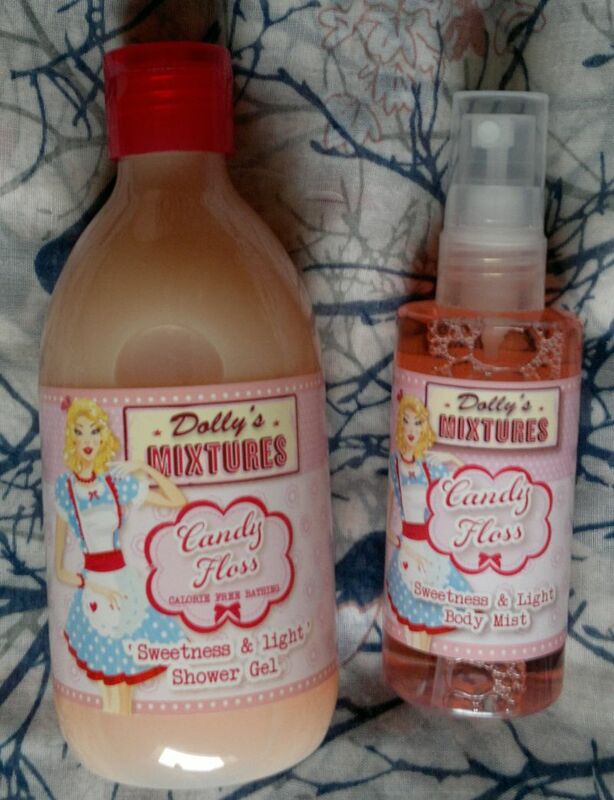 Dolly’s Mixtures Sweet & Light Candy Floss Body Mist is OK. In the beginning it’s just too strong and it has a smokey/burnt note. However, after a few minutes it does smell like candy floss. I think these 2 products are awesome fun! 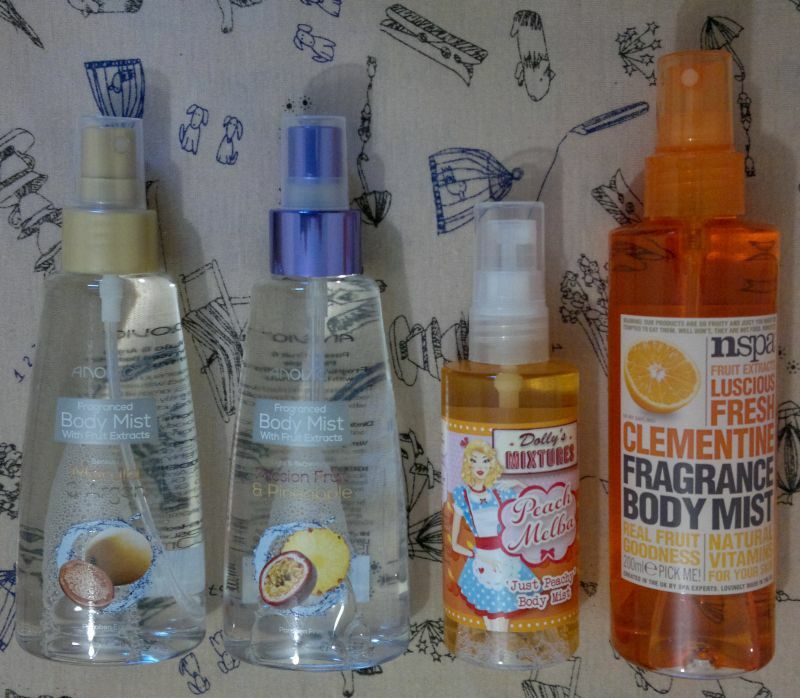 I wouldn’t want to smell like candy floss every day, but these sweet smelling products came in handy when I really needed a pick-me-up a few weeks ago. Good stuff! Hi there! And welcome to the latest episode of Reducing My Oldies Stash. 🙂 Today I’m reviewing Dolly’s Mixtures Strawberry Daiquiri ‘Shake It Up’ shower gel. From the bottle this shower gel smells exactly like strawberry daiquiri. I mean it! I can smell strawberry puree, lime juice, ice and booze! Wow! However, as soon as you lather up the shower gel, it changes from “wow” to a random (and faint) soapy fragrance. I think this is rather disappointing. And I’m saying this as someone who doesn’t even drink alcohol. The brand Dolly’s Mixtures is exclusive to Asda. Dolly’s Mixtures products are usually £2 each. 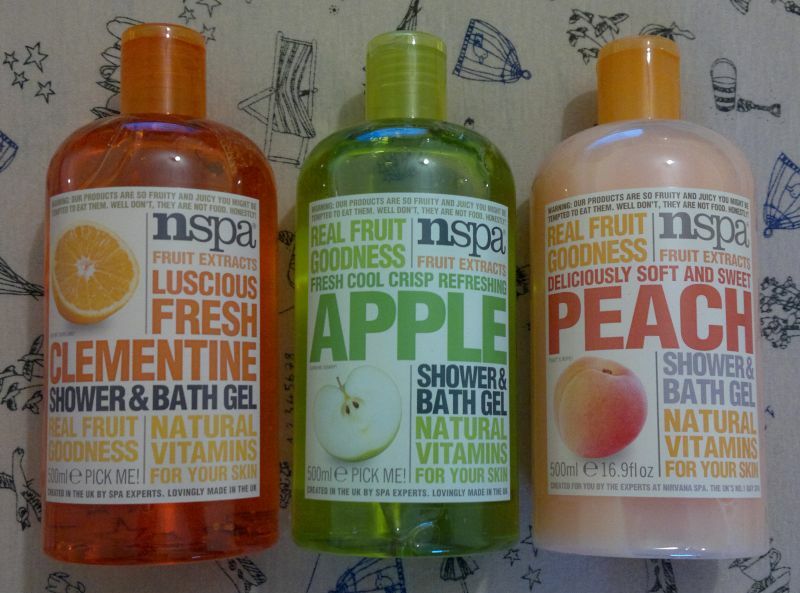 The shower gels are 300ml, the body sprays are 100ml. I paid £1 for this shower gel (half price offer). If you’d like to try Dolly’s Mixtures shower gels, I would recommend their fantastic Bubble Gum shower gel! Anyway, one of the body mists I found at my local Home Bargains store was this 100ml Dolly’s Mixtures Peach Melba ‘Just Peachy’ Body Mist. And it was 49p only! What a bargain! On the back of the bottle it says this body mist is a ‘fruity fragrance cocktail of soft white peach combined with velvety vanilla’. Sounds good. And now I’ve finally gotten around to actually try this body mist, and I’ve reached my verdict. I think this body mist smells like peach skin. It’s nice, but not very special. And I can’t smell any vanilla. I also think this fragrance is pretty much the same as Yves Rocher’s Plasirs Nature Yellow Peach fragrance – but this one is considerably cheaper. So whilst this body mist is nice, I don’t think I’ll wear it much. I might use it as a scarf spray, or I might pass it on to a teenage relative. Dolly’s Mixtures products are made in the UK and they’re exclusive to Asda (well, the soon-to-be discontinued stock seems to have been shipped off to Home Bargains). Dolly’s Mixtures products are made by the same company that makes all those wonderful NSPA products, and – unless there’s a special offer – Dolly’s Mixtures products are usually £2 each. Hi there! Today’s post is about two items I found at my local Asda – Dolly’s Mixtures Piña Colada Shower Gel & Body Mist. These products were on special – they were 75p each. 🙂 So I sniffed the shower gel and decided to pick up both items. Now let’s have a closer look! Dolly’s Mixtures Piña Colada Shower Gel is really nice. The piña colada fragrance is quite authentic. I just love the strong pineapple aroma! Another thing I like is that this shower gel is actually more of a shower cream – it’s very gentle on my dry skin! 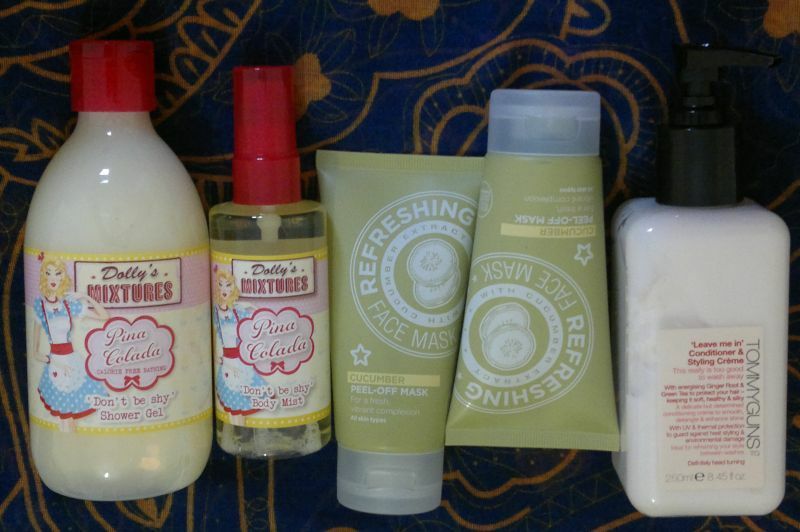 Dolly’s Mixtures Piña Colada Body Mist surprised me. Unfortunately not in a good way. I expected it to smell just like the shower gel. However, this body mist smells like 95% coconut with a hint of a non-descript fruity freshness. I’m not a big fan of coconuts in general, so I’ll be passing this body mist on to a teenage relative of mine. But if you love the smell of coconuts, this product is worth checking out. Dolly’s Mixtures Piña Colada Shower Gel & Body Mist are exclusive to Asda. The shower gels (300ml) and the body mists (100ml) are usually £2 – but lots of Dolly’s Mixtures products have been on special for quite some time. Let’s hope the product line isn’t going to be discontinued! And if you swing by your Asda soon, don’t forget to give Dolly’s Mixtures Bubble Gum shower gel a sniff! Hi there! In the past couple of months I haven’t done that much stocking up on stuff I don’t need. 😀 But I just couldn’t resist temptation (offers) the other day. 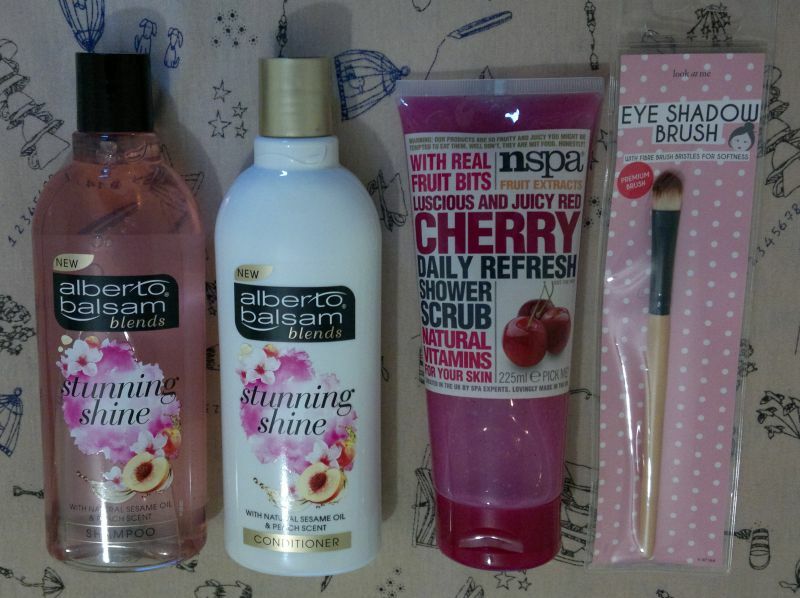 I went to Asda – and found a few items I had to have. And I placed three Superdrug orders in 24 hours. 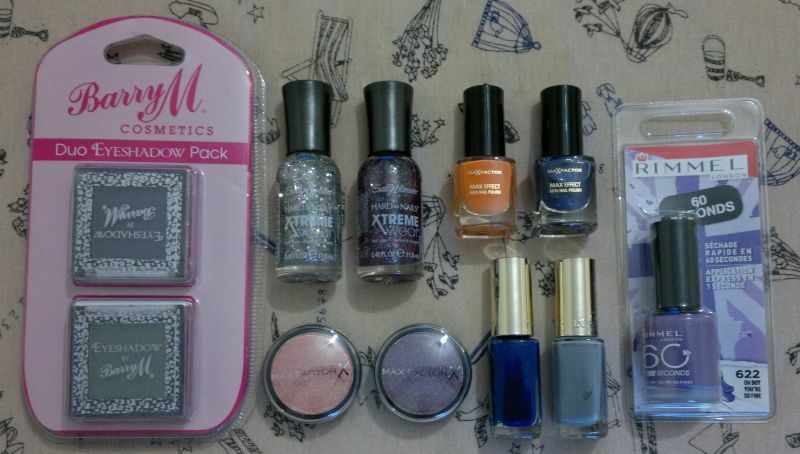 And then I swung by my local Bargain Buys store… Now here’s what I bought! 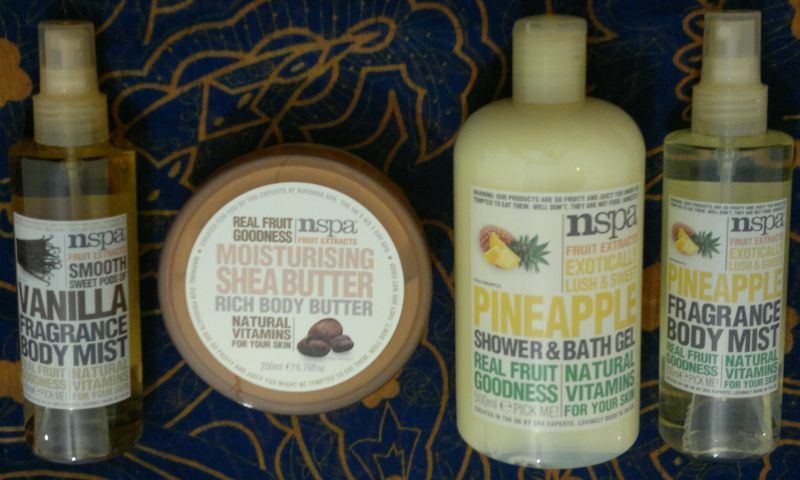 NSPA Vanilla Fragrance Body Mist (200ml), NSPA Moisturising Shea Butter (200ml), NSPA Pineapple Shower & Bath Gel (500ml) and NSPA Pineapple Fragrance Body Mist (200ml). These products were all on special and they were £2 each. 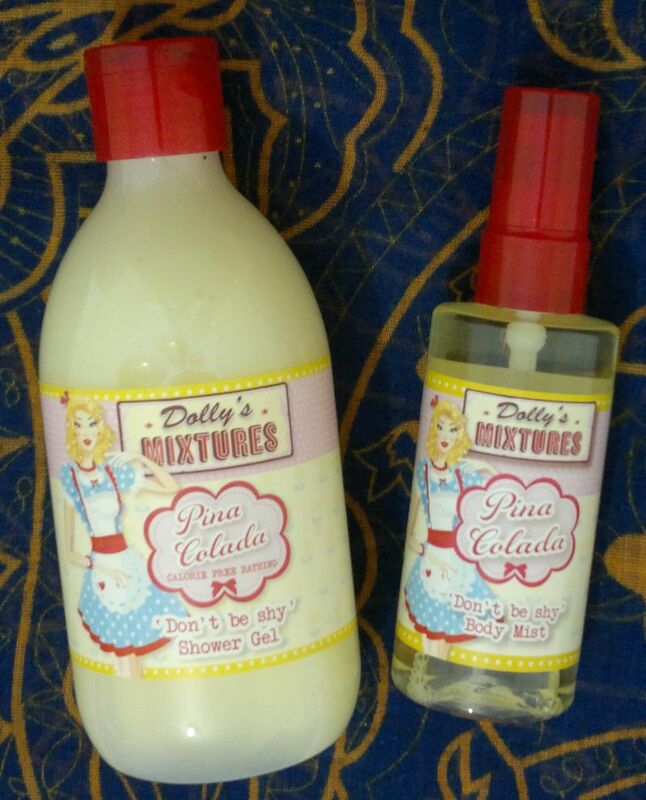 Dolly’s Mixtures Piña Colada Shower Gel (300ml) and Body Mist (100ml) – these were on special for 75p each! 2 Superdrug Cucumber Peel-Off Mask tubes (75ml each, there was a buy one get second half price offer – so that’s £3.98 in total for 150ml of product), Tommyguns ‘Leave me in Conditioner’ & Styling Crème (250ml) – I bought this one because it was 70p! 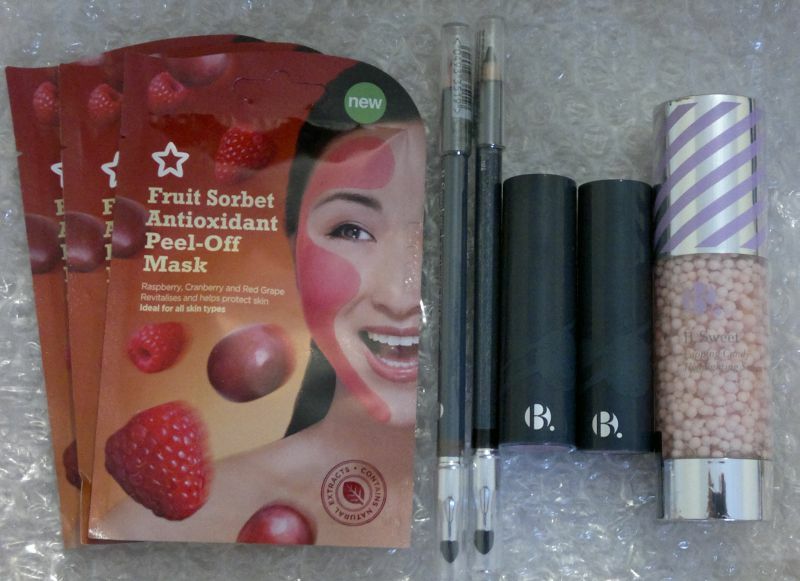 3 Superdrug Fruit Sorbet Antioxidant Peel-Off Face Masks – 49p each, 3 for 2 offer – so I paid 98p in total for 3 face masks. B. Soft Blendable Kohl Eyeliner 122 Chocolate and 100 Black – these were 90p each. B. Rich Intense Colour Lipstick 54 Eton Mess and 186 Rose Quartz. The lippies were £1.80 each. And then there’s the B. Sweet Popping Candy Highlight Serum – it was £3. 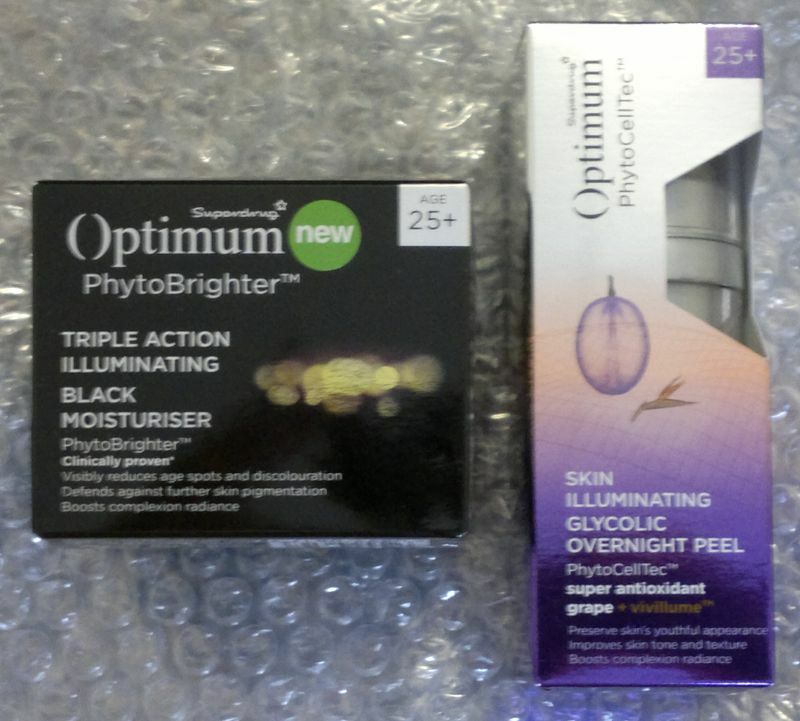 Superdrug Optimum PhytoBrighter Black Moisturiser and Superdrug Optimum Skin Illuminating Glycolic Overnight Peel. 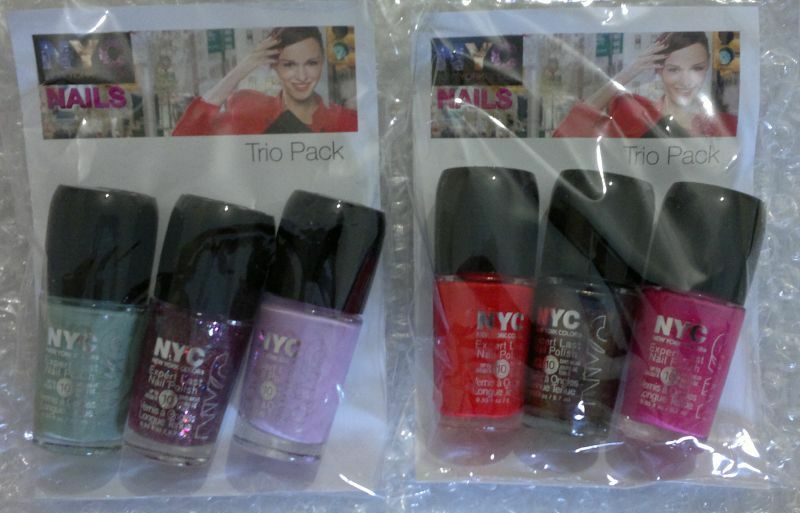 These products are usually £12.99 each – but thanks to a half price offer I paid £6.45 each only. B. nail polishes were 30p – so I just picked a few randomly – Mulberry, Peach Melba, 3 base coats, Piglet, Minx and Sea Foam.